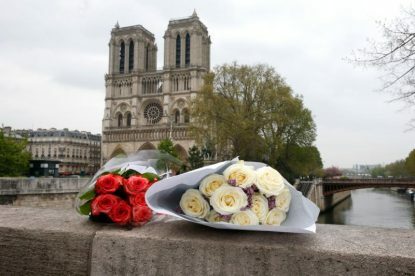 As U.S. Catholic leaders grappled with the enormity of the April 15 fire that ruined the Notre Dame Cathedral in Paris, the word "iconic" came to mind for many of them. Sydney Monfries, a Portland native, was a senior at the Jesuit-run university and weeks away from graduation. The Observer, a student newspaper at Fordham, reported that police said Monfries fell through an opening on the first landing of the tower. During the Easter Vigil April 20, Christopher Booty and his wife, Kristin, will be baptized at Blessed Sacrament Church in Oakland Park, along with their 8-month-old daughter, Catherine, and 3-year-old son, Maytham. Sean Holly a senior at St. Elizabeth High School in Wilmington, Del., spearheads Apollo: Youth in Medicine, a program that gives local high school students the experience life in the medical field by shadowing with doctors. Bishop Malone said April 12, 2019, he is "disappointed and dismayed" by a call for his resignation from St. Bonaventure University's president, Dennis DePerro. The university head criticized the bishop's handling of abuse cases, a claim that Bishop Malone called "unjust." UPDATED - Just after Christmas, parishioners at St. Richard Church in Jackson received a warning that someone pretending to be pastor Father John Bohn was using a fake email address to try to persuade people to buy gift cards for him. Under the new law, which goes against Catholic teaching on the sanctity of human life, adults with a terminal diagnosis may obtain drugs to end their lives. The law was signed by Gov. Phil Murphy, a Catholic. Phally Budock, who will enter the church this Easter, has always believed in God, but for a long time she did not understand why God allowed terrible things to happen, such as the atrocities she witnessed during the Cambodian genocide in the late 1970s.